Sleek new look and feel. Added optional NEW ACTION CAMERA feature and link to cloud-based photo and stats storage, as well as the ability to view your photos and stats on your own website. In-app purchases for messaging subscriptions, action camera, and photo scrapbooking available. Don't keep score-- watch the game!! 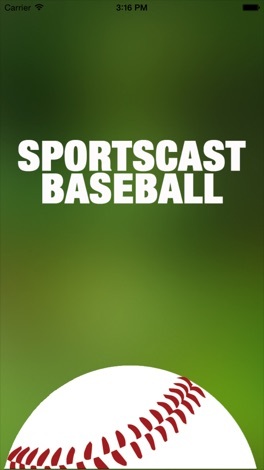 SportsCast Apps free you from keeping score and let you broadcast game stats and updates when you want to who you want. No need to keep a play-by-play box score- update your friends when a big play is made, when the score updates, or whenever you want to tell someone about a great play! 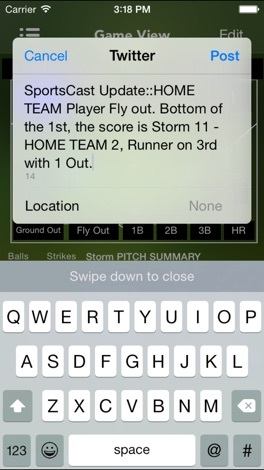 SportsCast Baseball enables you to selectively broadcast pre-formatted text messages about what’s going on in your game. 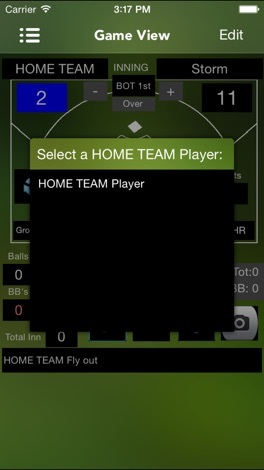 SportsCast Baseball’s intuitive screen allows you to populate runners on base, update score, outs, team names, and include a personalized message (“JJ HIT A GRAND SLAM! !”) if you choose with each text. SportsCast Baseball also includes a pitch counter! You choose when you broadcast and to whom. 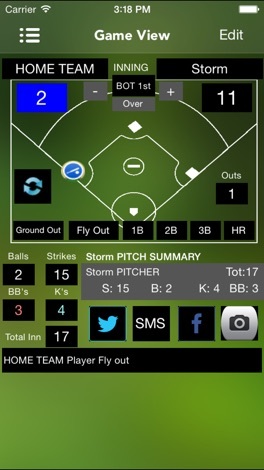 You can keep as many people as you want updated on a play-by-play basis and enjoy the game at the same time! Simply create a group (“Mom and Dad”), add contacts from your iPhone contact list (or manually enter them), and you’re off and running! Great for keeping grandparents updated, and even better if you’re at one game and your spouse is at another!!! Messaging subscription available. The standard (FREE) app comes with the ability to have 2 groups and 1 SMS recipient in each group. All versions have the ability to post to TWITTER and FACEBOOK. NEW: ACTION PHOTO CAMERA!!! Now you take pictures of the action in your game and send them to your group via SMS, complete with score and game status. Recipients get a photo imprinted with an ESPN-like scoreboard and inning, outs, and bases!! Very cool!! (NOTE: Action Photo Camera is an in-app $1.99 purchase). Play the classic snake with some new rules and features. Snake by XIMAD is another interpretation of the popular game, in which you need to direct it through the mines by using gestures and avoiding all the obstacles you come across. You should try to collect all the artefacts to complete the game and in addition there are other powerups that you'l….